One day after the unannounced LG V10 showed up in a leaked image, the company posted an official video teaser of the smartphone on YouTube. The 15-second video only shows the front-facing camera of the smartphone and hints a secondary display besides it. Also seen is the launch date – October 1. The video besides teasing the already leaked secondary ‘auxiliary ticker display’, says the handset would let users “be you” suggesting that the display might be customisable. Nothing else was shown in the video. We have already seen a leaked smartphone image by @evleaks showing the secondary display filled with five app shortcuts including those for camera, contacts, messages, and gallery. The sensors and the speaker grille are placed above the secondary display. At the bottom, the unannounced V10 sports the LG logo with no capacitive or physical buttons, all of which hint towards the inclusion of on-screen buttons. The ‘auxiliary ticker display’ of V10 is also said to be used to show RSS feed updates, text messages, and other notifications, similar to how Samsung utilised a similar feature in the Continuum handset. In the Samsung Continuum, users were offered a small rectangle display below the regular display and on-screen keys. The LG V10 smartphone was recently spotted on Tenaa (Chinese telecom certification authority) tipping some of the innards of the handset including model number – LG-H968. The handset as per the listing would pack a 5.7-inch QHD display with the ‘auxiliary ticker display’ placed above it; Qualcomm Snapdragon 808; 3GB of RAM, and 64GB of inbuilt storage. 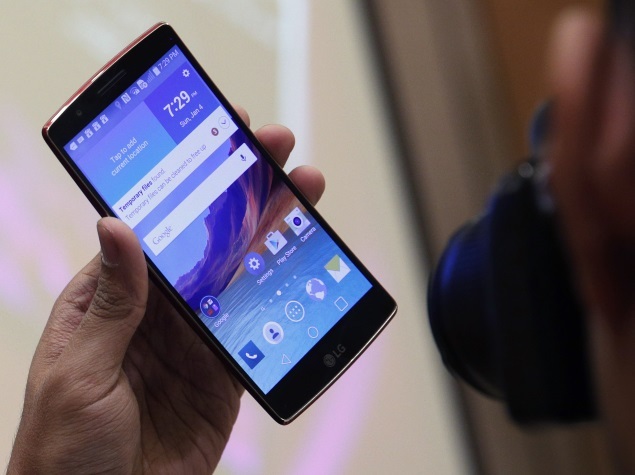 The LG V10 was also listed to sport a 16-megapixel rear camera and a 5-megapixel sensor up top. Other features included a fingerprint sensor, a microSD card slot, and 64GB of internal storage.